If you would like to receive ACT’s Monthly News Round-Up directly in your inbox, sign up for our newsletter. ACT is delighted to announce the 1st Annual Seymour Triple G Road Cycling Fundraiser. Donate, sign up to ride or come cheer the riders on Saturday, June 25th, 2016, Mount Seymour, North Vancouver. Sponsored by Loma Bike, Mt Seymour, Cycling BC, and Brite Coaching, this fundraiser will challenge riders with a 15 km ride up a 7-10% grade. This ride is considered “hors catégorie” (more than a Category 1 climb), and will demand heart, stamina and determination – much like the challenge autism presents for individuals and their families. Challenge your friends, family and colleagues to put together a team for the Seymour Triple G or donate online. Promotions: Friendly, outgoing people to hand out brochures at high-traffic cycling areas including Horseshoe Bay, Mt. Seymour, SFU, Iona Beach, or Galileo Coffee near Britannia Beach, weekend mornings, from May to mid- June. Photography: High quality photographers to take action photos of the riders and attendees on the day of the event. You’ll have to be fast! Day of Event Support: Help us with setup and registration, cheer on the riders and serve breakfast at the top. Please email info@seymourtripleg.ca if you are able to help. 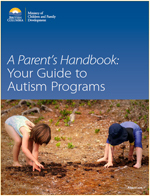 ACT- Autism Community Training is pleased to announce that we have been funded by the Ministry of Children and Family Development (MCFD) to manage the translation of MCFD’s A Parent’s Handbook: Your Guide to Autism Programs into eight languages. We anticipate that these translations will help ensure that more families will have access to the information they need to make informed decisions about their child’s intervention program. This project was announced by B.C.‘s Minister of Children and Family Development, the Honourable Stephanie Cadieux, at ACT’s 12th Annual Focus on Research Conference on April 15. The handbook will be translated into Arabic, Chinese, French, Japanese, Korean, Persian (Farsi), Punjabi and Spanish. The work will begin this summer. Download the English language version of A Parent’s Handbook. See the Ministry’s News Release for more details on this project. Sign up for ACT’s Mailing List to receive ACT’s Monthly News Round-Up for updates on provincial autism news, including the release of these translations. ACT’s 12th Annual Focus on Research was a great success. There were opportunities to share at the lunch tables, on the posters in the foyer and during sessions. Selected presentations were webstreamed, reaching communities across B.C. When ACT has the funding available, the sessions we recorded will be edited and added to AVA – Autism Videos @ ACT. The Invention and Reinvention of Autism – Dr. Roy Richard Grinker’s talk encouraged a second look at diagnostic tools to take into account cultural variations in child behavior. He encouraged professionals to consider whether or not it is culturally accepted to sustain eye contact, for adults and children to play together, or to point. If not, then these are insufficient diagnostic measures as it is necessary to consider cultural expectations for joint attention, play, or social interaction. Dr. Grinker’s fascinating book is well worth a read: Unstrange Minds: Remapping the World of Autism (www.unstrange.com). An Aboriginal Perspective on Supporting Children and Families with Special Needs – Rona Sterling-Collins, a First Nations consultant and parent of an 18-year-old with autism, described how she organized the gathering of her extended family to share a meal and learn about autism after her son was diagnosed. The workshop included autism awareness information and an opportunity for discussion without the presence of Rona or her husband. This helped the extended family “have a better understanding of autism”. Family Quality of Life and ASD Funding in B.C. – Dr. Grace Iarocci and Dr. Emily Gardiner talked about encouraging parents to engage in research by folding research into a fun summer camp for children. The tasks are embedded into games or puzzles, and the group (not individual) research results are eventually shared with families. See the ADDL lab page for details on 2016 camps. Connecting with South Asian Families of Children with Autism – Preetinder Narang’s presentation focused on strategies for service providers to develop cross-cultural competence with the families they support. The content from this presentation will soon be available in a new chapter for ACT’s Manual for B.C. titled Guide to Working with South Asian Families Affected by Autism. Preetinder is a founding member of ACT’s South Asian Autism Project (ASAAP), a dedicated group of volunteers committed to raising awareness of autism in B.C.’s South Asian community. Bilingualism and Language Development in Children with Autism – Dr. Pat Mirenda’s important presentation analyzed the research on whether the families of children with autism should continue to be discouraged from speaking their language of origin at home. Her conclusion was definitive – there is no reason to discourage families speaking multiple languages at home. Indeed to do so has many negative consequences including cutting off children with autism from their extended families and cultural and religious traditions. Download Dr. Mirenda’s handout for references to this research. ACT – Autism Community Training is the primary source for objective information and support on autism in B.C. A not-for-profit society led by a Board of Directors, ACT is seeking three new board members in time for our AGM on May 31st. This year we are keen to identify candidates who understand the diverse concerns of families raising children with autism from the perspective of parents, siblings or other members of the extended family, as well as having professional expertise. ACT’s Board is a governance board and does not involve itself in daily operations. Board members are called upon to provide the board with professional advice. Currently we would like to augment the considerable strength of ACT’s Board in the areas of human resources, media relations, marketing and fundraising. For more information on ACT’s current Board see www.actcommunity.ca/about-us/board-members/. Those interested in finding out more, may contact the head of ACT’s Nominations Committee, Helga Marshall, c/o dpugh@actcommunity.ca. The deadline for submitting a resume and cover letter to dpugh@actcommunity.ca is May 9, 2016. Send new camps: Send in location, description and contact information for your camp. Update last year’s camp: If your 2015 camp was in the AID, please update it for 2016. Parents and caregivers can also check out the Autism Support Network moderated ABA Therapists BC Facebook page: facebook.com/groups/757489514274541/ where parents and BIs can connect. Over the 12 months of 2015, 93 RASP professionals were approved, and 13 Behavior Consultants moved from category B to category A. This April, traditionally a slower month, four new RASP professionals have been added to the RASP. ACT is bringing back popular speakers and courses this summer, including Intro to ASD (POPARD) with Dr. Kenneth Cole, in Vancouver and in Surrey; a Master Class in Social Thinking with Michelle Garcia Winner and Pamela Crooke and specialized instruction in Executive Function Skills with Sarah Ward. The Canucks Autism Network (CAN) provides autism training workshops throughout the year to build capacity in communities across British Columbia. Training equips community recreation staff, programmers, and managers with strategies for supporting children and youth with autism in community settings. Learn more about upcoming workshops in your community. This entry was posted in ACT Resources, Autism Information Database, Education and Training, Events, fundraising, Media, News, News Round-Up, Non-ACT Event, RASP news on April 29, 2016 by ACT.